Low rates have stoked mortgage refinance applications throughout Northeast Florida, too. When asked for paperwork and/or supporting documentation, providing a 24-hour turnaround can keep your loan “top of mind” with your underwriter. This is important because underwriters are people and, sometimes, people “forget”. 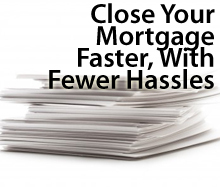 The fewer times that an underwriter has to “re-learn” your file and its nuances, the better your chances for a speedy approval.